I thought I’d take an Irish theme on the latest entry into my “Single View” post series since today is St. Patrick’s Day. Though, there is some confusion to where this ancestor originally came from. William Henry THOMPSON was born sometime between 1810 and 1816 in either Ireland, England, or Scotland, depending on which record you look at. In the 1870 Census of Morrison, Brown Co., Wisconsin, he is listed as being born in 1810 in England. 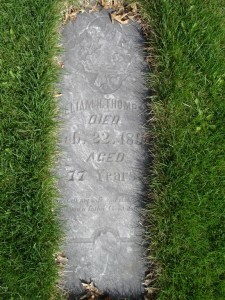 On his headstone, the listing of his daughter in the 1905 Wisconsin State Census, and the Wisconsin Deaths and Burials, 1835-1968 entry, he was born in 1813 in Ireland. In the 1880 and 1860 Morrison, Brown Co., Wisconsin census records, he was born in 1816 in Ireland. 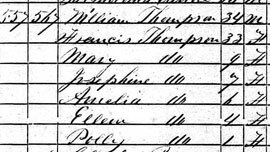 Finally, in the 1850 Census of Granville, Milwaukee Co., Wisconsin and listed as his birthplace in entries for his daughter, Pauline (THOMPSON) FIRMENICH, he was born in 1816 in Scotland. Adding to the fact that the name William THOMPSON covered about 15 billion people back then, he has been a tough one to find. What I do know is that William married Claude-Françoise “Francesca” QUINET in about 1839. I have their marriage location listed as Syracuse, Onondaga Co., New York, but not a lot of source information for it. Both the QUINET and THOMPSON families seemed to have been in the area before they traveled to Wisconsin. The family first settled in Granville, Milwaukee Co., Wisconsin which is now part of northwestern Milwaukee. I have William recorded in the 1842 Wisconsin State Census in this area and in the 1850 Census. They must have moved up to the north to the town of Morrison in Brown Co., Wisconsin sometime between 1852 and 1857 as their daughter Margaret was born in Granville in 1854 and their daughter Catharine in 1857 in Brown County. They are first listed in Morrison in the 1860 Census. As noted on the record, they are also living next to a John THOMPSON family, which from further research seems like a good candidate to be William’s brother. 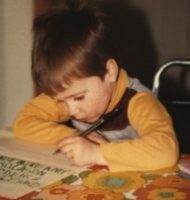 That may help in deeper research. William and his family lived in the Morrison area through the 1880 Census. Originally, I wasn’t sure when William passed away, but I did know when his wife Francis (QUINET) THOMPSON passed away. One summer, my wife and I traveled to the Wrightstown, Wisconsin area near to Morrison to search for her headstone. We not only found her headstone, but also William’s. On his headstone his is listed as having died on 22 Feb 1890. I’m not exactly sure where to start on finding more information on William since his name is so common and his information is so different in each record. Somewhere in my searching, possibly on an uploaded family tree, his mother’s name was listed as Isabella. I have no proof of this, but I have kept it in mind. 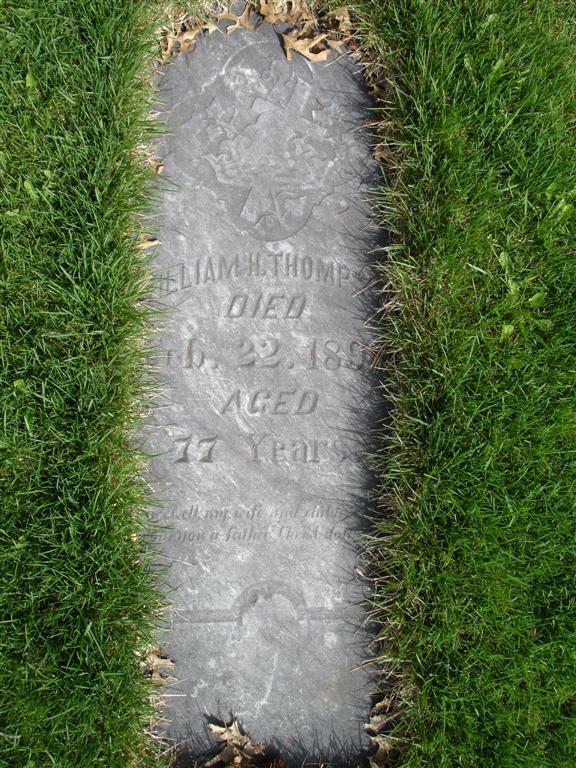 Last year, using the new FamilySearch website, I found a Wisconsin Death record for a Wm THOMPSON with dates extremely close to my William’s dates. I have no proof at the moment that this is my William, but if so, it lists his parents as William & Fasmie (RUINNET) THOMPSON. Have you ever needed to research a very common name? How did you go about doing it?